Jeep Reveals Grand Cherokee, Wrangler, Compass Concepts for 2017 Easter Jeep Safari. After some gentle teasing, Jeep finally revealed its lineup of concepts for the 2017 Easter Jeep Safari in Moab. Slated to be shown in the flesh April 8-16, this year’s concepts are based around the Wrangler, Grand Cherokee, and Compass platforms. This author’s personal favorite is “Grand One,” a celebration of the 25th anniversary of the Grand Cherokee. Based on the Jeep ZJ platform, Grand One features custom 18-inch wheels, high-clearance front and rear fascias, blocky fender flares, and a subtle woodgrain effect for the bodysides’ light blue paint. Inside, the Grand One gets 90s-inspired trims and materials, along with a vintage mobile phone that’s roughly the side of a cinder block. Like many original Grand Cherokee ZJ sport-utes, the Easter Jeep Safari concept gets a 5.2L V-8 with a four-speed automatic, with power shuttled to selectable locking front and rear axles. Beefy 33-inch BFGoodrich tires and a 2-inch suspension lift aid both appearance and off-road performance. Translucent body panels set the JK Wrangler Unlimited–based Jeep Safari apart. Designed for when a flimsy convertible roof is ill-advised, the Safari nonetheless gives all passengers a great view of nature, thanks to see-through doors and roof panels. Aluminum and vinyl comprise the unique “windoors,” which are center-opening to make entry and exit a bit more memorable and interesting. The two individual rear buckets are swiveled slightly outward, making viewing wildlife and scenery easier for the rear-seat passengers. A dash-mounted iPad and roof-mounted drone add to the Safari’s future-tech vibe. Under its slightly shortened body, the Safari gets Dana 44 front and rear axles with differential lockers (supplied by Jeep Performance Parts), 35-inch BFGoodrich Mud-Terrain KM2 tires on 18-inch wheels, upgraded brakes, and a cold-air intake for its 3.6L V-6. Custom skidplates, steel front and rear bumpers, and a slick aluminum roof rack add style, function, and protection to this Jeep. Is the Jeep Quicksand concept, a hot rod, a sandrail, or a Wrangler JK? Why not all three? With a 392ci Hemi V-8, six-speed manual transmission, cutaway hood, and gasser-style open headers, the Quicksand certainly has the credentials to be a pretty wild hot rod. The chopped roof and windshield and open bodysides add to the 50s-style flavor, as does the extended wheelbase and staggered tire setup. The company says the 32-inch front and 37-inch rear tire layout is a Jeep concept first. Helping it pound sand more effectively are those aforementioned BFG KM2 tires, mounted on kidney-bean alloy wheels and suspended with coilover shocks front and rear. A Warn winch is mounted in the Moon tank up front, while recovery ropes replace a hot rod’s drag chute at the back. Rich-looking red bucket seats liven up the interior, and the flat aluminum door panels, chrome roll bar, and folding front windshield wouldn’t look out of place in American Graffiti. Based on the all-new 2017 Jeep Compass, the Trailpass pushes the Trailhawk model’s off-road performance envelope with a 1.5-inch lift and Continental TerrainContact all-terrain tires. 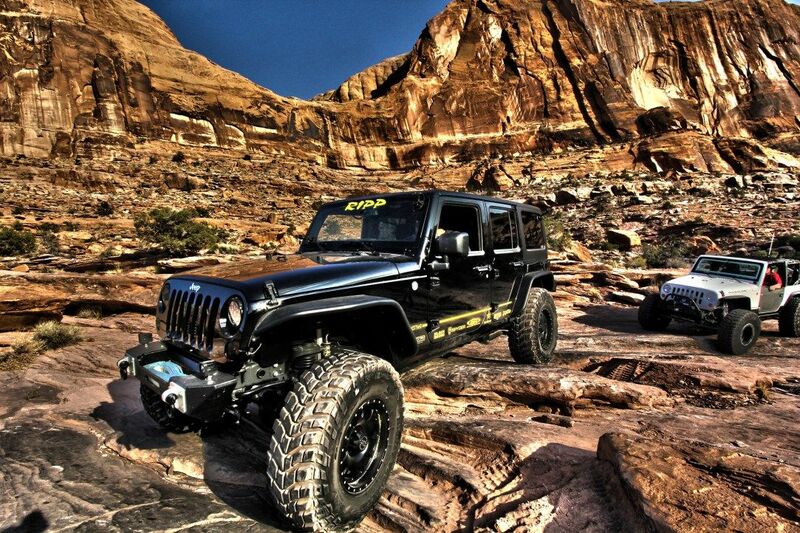 Jeep Performance Parts on the Trailpass include a roof basket, rock rails, and roof rack crossbars. Tinted headlamps, Gloss Black mirror caps, and custom hood and body graphics add some style. The roof rack is fit with the aforementioned basket, as well as trail essentials like the traction mats. Katzkin leather seats and body-color accents liven up the interior, which also gets Jeep Performance Parts all-weather floor mats. A Tigershark 2.4L I-4 and nine-speed automatic transmission send power to all four wheels. Jeep says the Switchback concept is fit with a multitude of Mopar bits and Jeep Performance Parts to make it the ultimate off-road machine. Based on the JK Wrangler Unlimited with the 3.6L V-6 and five-speed automatic transmission, Jeep created the Switchback using 17-inch concept alloy wheels, 37-inch BFGoodrich Mud-Terrain KM2 tires, and a Jeep Performance Parts 4-inch lift with remote-reservoir shocks. Other accessory bits include Dana 44 front and rear axles and heavy-duty differential covers, plus a set of 10th anniversary steel bumpers, a Rubicon winch, a grill guard, and a cold-air intake. A concept hood and half doors get topped by a concept hard top/safari rack combination. Jeep accessory high-clearance fenders, taillight guards, and reinforced spare tire carrier help round out the exterior. Concept lightbars and A-pillar lamps combine with Jeep accessory LED head, tail, and foglamps. Inside, Katzkin leather adorns the seats, while a spray-in bedliner and all-weather mats protect the flooring. First-aid and roadside safety kits make sure the Switchback is ready for anything that might come its way. Designed to light the way for the off-road industry, the Jeep Luminator concept features a long list of concept and accessory lamps, jointly developed with lighting supplier Magneti Marelli. Magnetic underbody rock lights, powerful 7-inch projector headlamps, LED taillamps, and A-pillar LED spotlights help provide better visibility on the trail. Auxiliary upper bumper lighting includes cornering foglamps that turn with the steering wheel to illuminate corners, and a low-profile LED lightbar is protected behind the windshield for even greater off-highway visibility. The Luminator also features a hood-mounted “scanning” LED lightbar that actively seeks and spotlights potential hazards, such as animals or other obstacles. In back, the center high-mount stop lamp includes four colored LEDs to help with trail-guiding: red (stop), amber (1-3 mph), green (3-25 mph), and white flood lighting. A roof-mounted solar panel provides auxiliary power, while a lighted drone and landing pad also appear up top. A capacitive touch display on the driver-side rear window links to internet and GPS services. First seen at the 2016 SEMA Show, the CJ66 concept features a hodgepodge of classic and modern Jeep features, bundled into one slick package. A Jeep Wrangler TJ frame gets a 1966 Jeep CJ body attached, powered by a Mopar 5.7L Hemi crate engine and six-speed manual transmission. Wrangler JK elements abound, and the Copper Canyon paintwork looks beautiful on the unique mix of Jeep’s past and present. Riding high on 35-inch BFGoodrich tires and a 2-inch lift, the Jeep CJ66 is as capable as just about anything else in the company’s concept lineup.